Baby Carriers of Supreme Awesomeness! A good friend of ours, Amanda, is starting a home business selling baby carriers. Specifically she’s making copies/derivatives of an African baby carrier her mom brought home for her when she was in Africa. Since I’m a pretty big fan of baby/parent contact, snuggling, breastfeeding and all that sentimental stuff, I thought I’d give her a shoutout here. I know she’s going to be selling these things, and I think she’s going to be doing custom orders. I’m not sure what she’s asking, but you can probably send her an email ( littlesaintsatplay @ hotmail.com) and find out the details. Tell her I sent you. Jeffrey Closs and Samantha Sinkinson joyfully announce the birth of their baby girl. 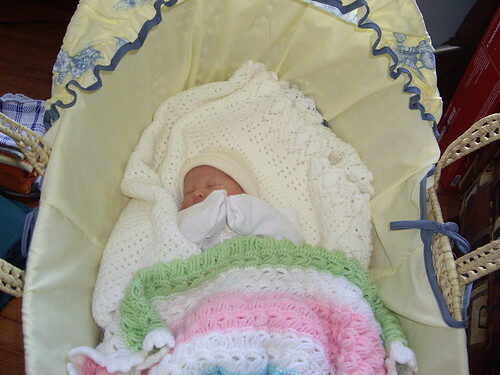 Dylan Aubrey Closs was welcomed by her parents and older sister Ivadel on Wednesday 19 March, at twenty minutes after eight o’clock in the evening. Samantha, Jeffrey, Ivadel and Dylan would like to invite you to an open house to welcome the baby on the 3rd of April . You will find the event details below. Some refreshments will be provided throughout the evening to better accommodate people with varying schedules. Time: 4pm – 8pm, step in and out as your schedule dictates. Contact: Feel free to contact us by email at suprspi@gmail.com or by phone. Some refreshments will be provided. RSVP not required, but appreciated. We got home today. I’ve got pics of Dylan uploading into flickr right now, but we have to jet out. I’ll put a longer post up when I get back, and I’ll put some of those pictures on the front page as well. So for now, yes, she is beautiful. She’s a perfect little baby girl, and we’re both really excited. She’s getting to meet her family and friends, and we are home. You can phone us at home and we’ll try to answer. You can feel free to stop by, and we’ll most likely be home, but no promises! If you check our most recent flickr uploads on the right hand side you should be able to see the pics as my flickr uploader gets them on there. I need to buy a flickr account so I can put up more pics and make more albums. Talk to you later! Thanks everyone! And thank you especially to Erin for updating our site while things were going on. We talked to some people who enjoyed it, and we’re very thankful! Sam is still in labour – her contractions are now 2 min. apart and lasting about 1 min. each. That’s really all I know for now. I’ll post again when something more exciting happens. Sam is 3cm dialated and her contractions are 5 min. apart. They are going out for lunch, and then heading back to the hospital to have the baby! I’m so excited! Now the question is… Boy or Girl?? I’ll post more when I hear from Jeff again.